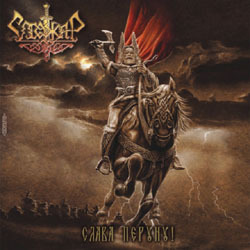 Slavonic pagan folk metallers Стожар (Stozhar) from Yaroslavl of Russia have announced the release of their second full-length album entitled “Слава Πеруну“. Their new album is ready and it will be released by the end of May 2014 via Stygian Crypt Productions, the Russian label that last year released also the band’s debut album “Ни Шагу Назад“. The band tried to make its sound more powerful, with unusual lyrics, more aggressive and at the same time deeper. Along with live bagpipes, flutes and violin, ”Слава Πеруну” will also feature electronic instruments, creating a really special atmosphere! Стожар have unveiled the cover artwork and album tracklist.